Dodda Veerarajendra sat on the throne of Kodagu from 1791 to 1809 and is considered the hero of Haleri dynasty that ruled the land for more than 200 years. Dodda Veerarajendra was baptised by fire as it were. As a young man in his mid-twenties, he crafted a dramatic escape in 1788 after having been in Hyder Ali and Tipu Sultan’s captivity for eight years. By 1791, with help from Kodava chieftains, he managed to gradually gain control over his kingdom. In 1790, he signed a friendship treaty with the East India Company and formed an alliance with the British. It was in April 1791 that a senior British officer, General Robert Abercrombie, who was also the Governor of Bombay, visited Kodagu to hold discussions with Dodda Veerarajendra regarding specific help that they wanted from him. General Abercrombie had travelled from erstwhile Bombay and was on his way to Srirangapatna. Dodda Veerarajendra met the General who arrived from Tellichery. The location where they met was on a hillock about ten kilometres from the border. The General was quite taken-up with the indomitable young raja. As required by the British, the raja readily provided supplies for their troops, beasts of burden to transport war material, and a place for the horses and elephants to be looked after. He also agreed to provide land for setting up a field hospital to treat war casualties. In 1792, General Abercrombie again met the raja of Kodagu on his way back from Srirangapatna, at the same spot as their earlier meeting. 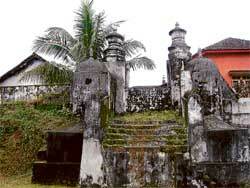 The raja had made elaborate arrangements to make the General’s stay comfortable. The elevated spot provided a panoramic view of the Western Ghats. During this visit they had more time to discuss a variety of subjects. General Abercrombie was fascinated by Dodda Veerarajendra’s narration of the history of the Haleri dynasty. He requested the raja to record these details which Dodda Veerarajendra did, several years later, under the title – ‘Rajendraname’. This is the only recording of the early history of Kodagu. General Abercrombie later became the commander-in-chief of the British Army in India. He remained a good friend of Dodda Veerarajendra and was instrumental in Rajendraname being translated to English. Dodda Veerarajendra was very happy after these two meetings with General Abercrombie. He felt secure after gaining British support. He wanted to commemorate this historic development and decided to found a town around this hillock where he had important discussions with the British general. He named the town after himself, Veerarajendrapete, and started construction of a fort and an ammunition dump on this hillock. A little distance away a pond was dug for the horses and elephants to be serviced. Earlier wars had depopulated Kodagu to a great extent. Dodda Veerarajendra invited people from neighbouring areas with promise of land to settle down in Veerarajendrapete. Amongst those who made Kodagu their home were about 100 Muslim men and women from Kannur whose ancestors had earlier fled Bengal in 1757 after the Battle of Plassey. About 700 Christians also took refuge in Kodagu. Dodda Veerarajendra provided land for them to build a church, St. Anne’s Church, which is very much in existence to this day. In addition, there were Mudaliars, Jains, Telugu Chettis and Moplahs from Kerala who settled down in the new town. Veerarajendrapete gradually came to be known as Virajpet. Presently, this busy town has streets named Bengali Street, Jain Street and Telugu Street depending on the original settlers. This fort in Virajpet was last mentioned in a letter dated February 24, 1837 written by General Mark Cubbon the British Commissioner in Bangalore, to Captain C T Le Hardy the Superintendent of the then Coorg, granting a sum of Rs 150 for repairs. However there is no trace of this edifice now except for the two entrance gate-posts. It is surprising that these remnants of the first structures to be built in Virajpet as far back as 1792 have not been paid much attention to. The gate-posts have withstood the ravages of time, but have ingloriously become a part of the wall surrounding the PWD Inspection bungalow which now occupies the site where Dodda Veerarajendra met General Abercrombie.